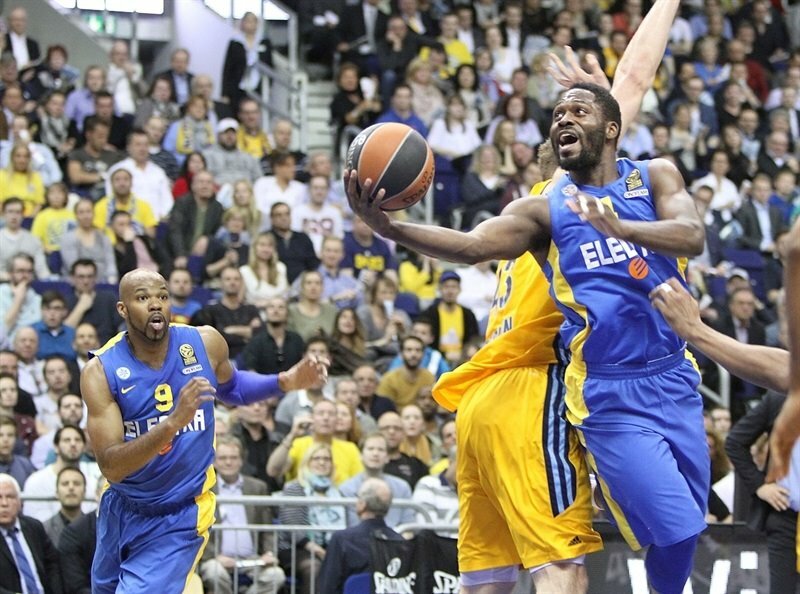 Defending Turkish Airlines Euroleague champion Maccabi Electra Tel Aviv outlasted ALBA Berlin 64-73 Thursday at O2 World in the German capital to clinch a playoff berth and deny the hosts their first taste of the playoffs. 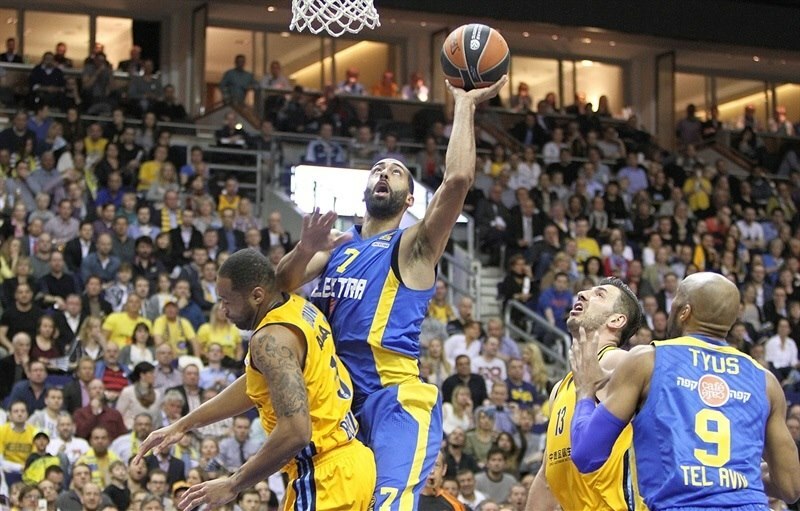 Maccabi never trailed, though ALBA kept it close throughout. The game was tied twice in the fourth quarter and ALBA was within 63-66 with four minutes to go. 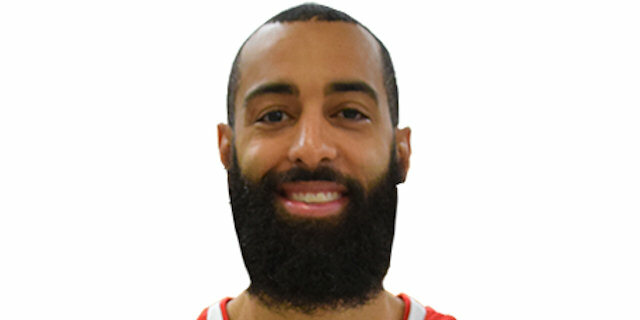 However that’s when Devin Smith sank his seventh three-pointer and Maccabi held the hosts to just a single point the rest of the way. 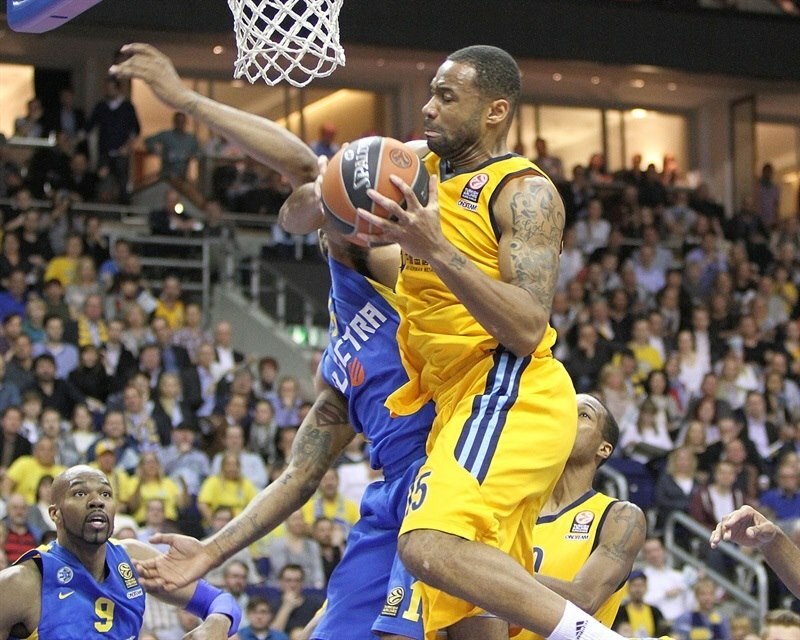 Maccabi improved to 9-5 in Group E, finished in third place and will face Fenerbahce Ulker Istanbul in the playoffs. ALBA finished its season with a 7-7 record and in fifth place in the group. ALBA’s record is the same as fourth place Panathinaikos, which claimed the last remaining playoff berth on a tiebreaker over ALBA. Smith’s 7 threes tied a Maccabi record set by Sarunas Jasikevicius in January 2004. He finished with a career-high 28 points. Brian Randle added 13 points and 2 blocks, Sofoklis Schortsanitis scored 10 and Alex Tyus grabbed 10 rebounds for the champs. 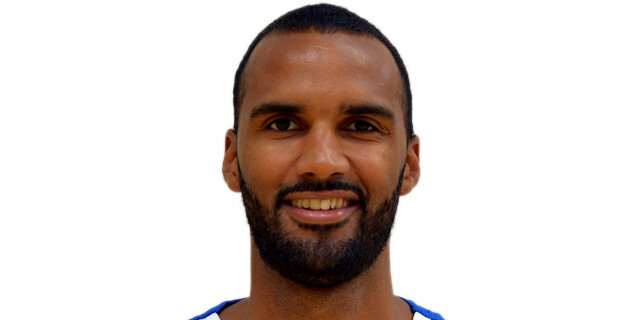 Alex Renfroe led ALBA with 10 points, 9 assists and 3 steals. Jamel McLean and Leon Radosvic each scored 10 too and Reggie Redding and Marko Banic netted 9 apiece in defeat. Maccabi won the opening tip and Randle attacked the rim for the first basket. 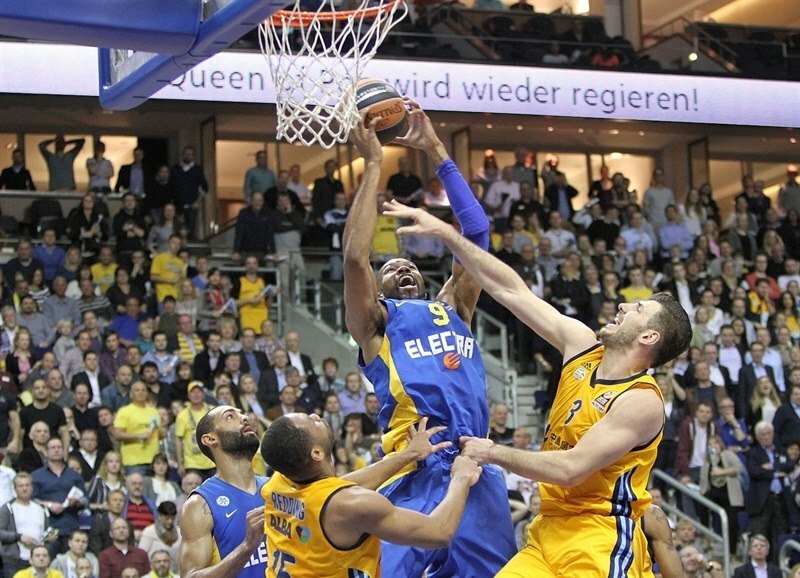 Schortsanitis scored in the paint before Cliff Hammonds got ALBA going with a three-pointer. 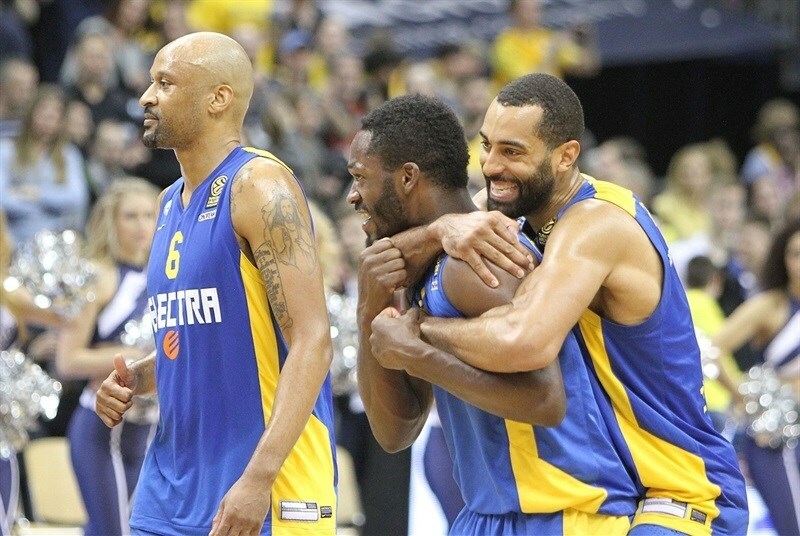 After Schortsanitis blocked McLean, the champs got a pair of triples from Smith for a 3-10 Maccabi advantage. 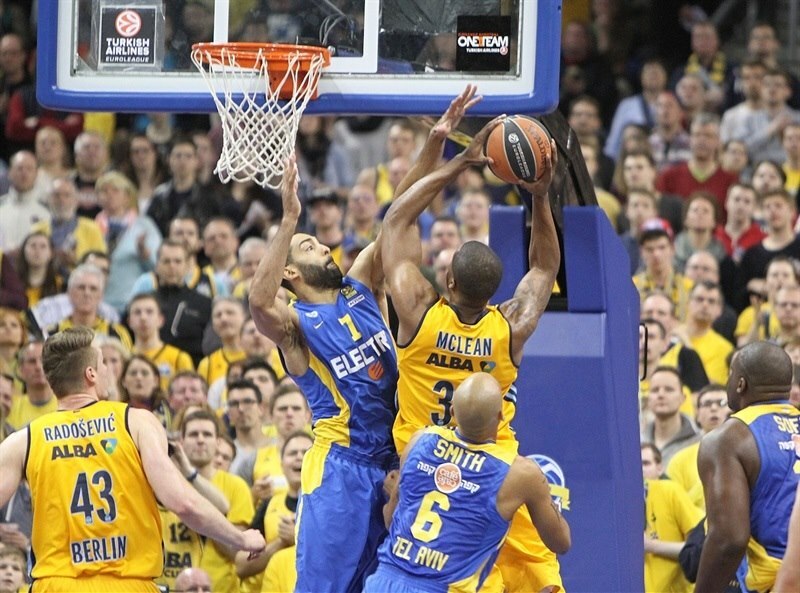 Maccabi remained aggressive on the defensive end and Randle’s layup made it a 9-point lead. Redding and Smith traded three-pointers to make it 6-15 midway through the quarter. Renfroe and Jonathan Tabu both drilled triples for the hosts to get within 3. Randle scored the visitors’ next basket. Akeem Vargas’s jumper after eight minutes was ALBA’s first basket inside the arc. Tyus buried a hook shot, but stopped McLean with a foul at the other end. McLean split the resulting free throws. Jeremy Pargo hit a mid-range jumper, but Redding stole an inbounds pass in the closing seconds of the quarter and dunked to close the gap to 17-21. 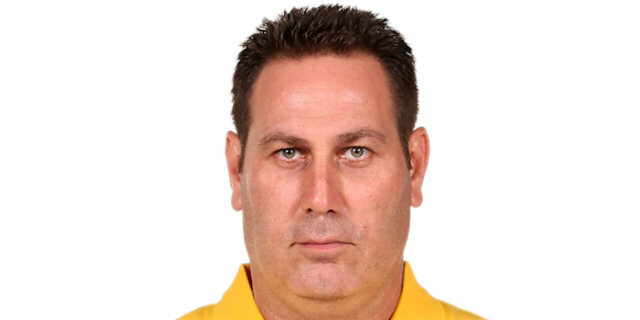 Maccabi went inside to Big Sofo for a basket-plus-foul and then forced a 24-second violation. 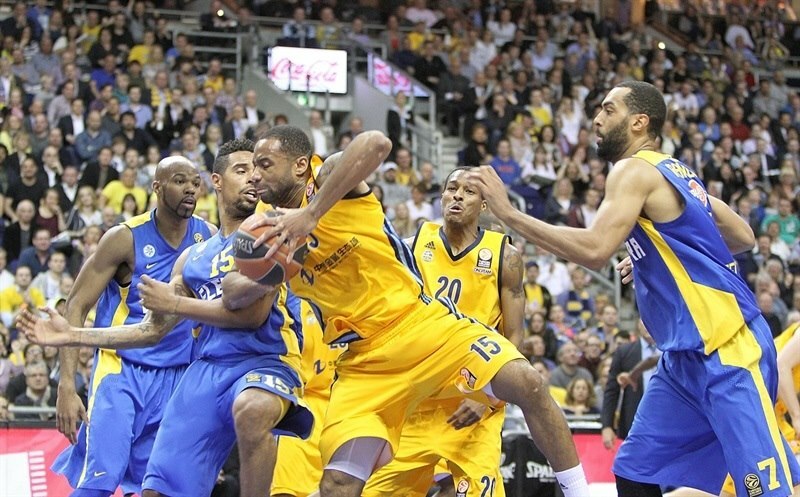 Smith stepped up with his fourth triple to match Maccabi’s biggest first-quarter lead, 9 points. Hammonds answered with a jumper and McLean scored inside, but Randle beat him downcourt for a slam. Banic added a pair of long jumpers to make it 25-28. After a Maccabi timeout, Radosevic added a jumper to bring the hosts within 1. Randle’s jumper made it 27-30 midway through the quarter. Renfore tied the game with a three-pointer, but Pargo drove and spun for a tough layup and Nate Linhart’s steal led to a Smith layup as the visitors regained control. Smith shined with a rebound and long outlet pass to Linhart for a layup and a 6-point advantage. Redding answered with a jumper, but Randle bettered him with a three-pointer. McLean got to the line for 2 more points, but Smith kept Maccabi rolling with a reverse layup to make it 34-41 at the break. Both teams missed their first few shots of the second half. After Randle missed 2 free throw attempts, Radosevic got a good roll on a jumper. Ohayon went through the ALBA defense for a layup. Hammonds knocked down a three from the corner to make it 39-43. 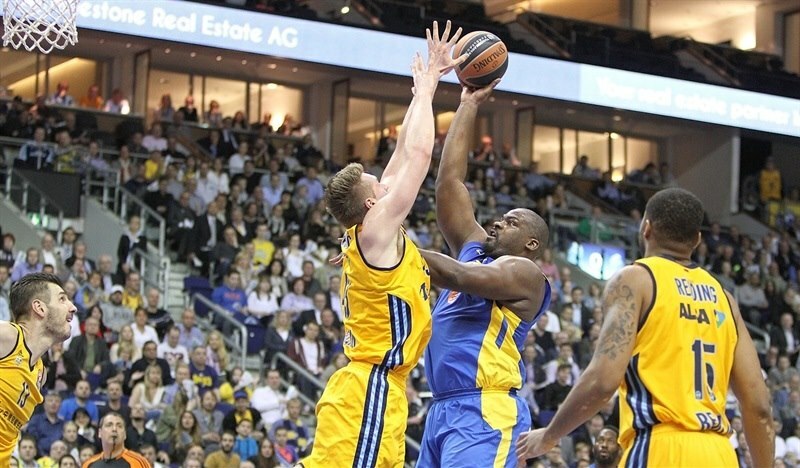 Maccabi’s starting frontcourt of Schortsanitis and Randle both went to the bench with 3 fouls. Radosevic closed the gap to 2 with free throws. Tyus scored inside for Maccabi and Smith scored a tough layup to make it 41-47. Renfroe got to the line for 2 points for ALBA; Pargo got to the line and missed twice for Maccabi. Linhart committed his fourth foul, which Renfore turned into 2 free throws to get within 2 again. With both offenses stalled, all the points were coming from the line. Pargo split free throws with two minutes left in the quarter to make it 45-48. There defensive highlights at both ends before Redding picked out Banic for a layup to bring ALBA within 1. Tyus restored a slim Maccabi cushion with 2 free throws before McLean made 2 of his own. Smith nailed his fifth three-pointer; Redding drove for a layup that made it 51-53. Smith connected on his sixth three, but Tabu matched him with his second. Smith pulled up for another three, but McLean blocked him. Radosevic tied the game at 56-56 two minutes into the fourth quarter with a jumper. Radosevic was called for an unsportsmanlike foul on Schortsanitis. The big man made the 2 free throws, but Smith missed on the ensuing play and Banic tied the score again. Big Sofo scored again and was fouled, but committed his fourth foul on the other end. Still he got to the line to make it 58-62. Banic split free throws before Ohayon’s pull-up jumper gave the champs a 5-point edge with five minutes to go. Tyus converted a tough layup and drew a foul. McLean netted free throws at the other end and after Schortsanitis fouled out, Radosevic’s free throws closed the gap to 63-66. 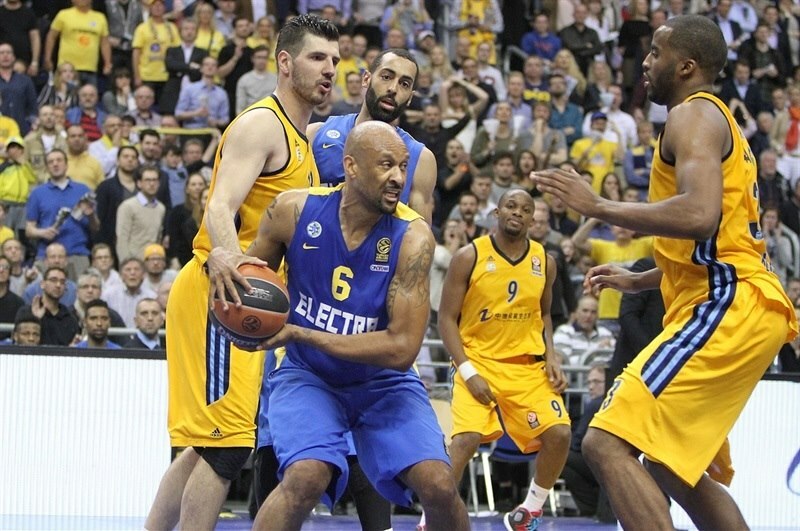 Smith kept Maccabi in control with his seventh three-pointer of the night. Maccabi looked to kill the clock and an offensive rebound by Randle helped, but the ALBA defense kept its side in the game. McLean split free throws. Renfore fouled out and Smith split the ensuing free throws. Redding airballed a three with just under two minutes to go and Tabu and Redding each missed layups. Ohayon made it a three-possession game with a free throw as the champs started to celebrate the chance to defend the title in the playoffs. 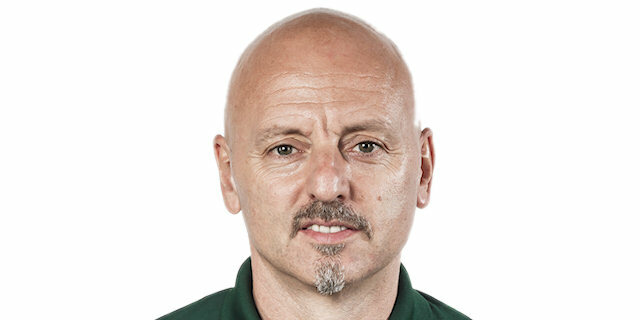 "We are proud of what we achieved this Euroleague season. We were the first German team with seven Top 16 wins. But of course a win today would have been great. " "We came here with one clear goal: to win no matter what. The key was to match their aggressiveness and intensity and we did that well, because we knew that things would work out. We don’t lack talent. Everyone did their job without exception. Devin made the big shots, Alex rebounded, Nate had 2 big steals and you can say something about every player. It was a great win, but no one is celebrating. We are looking ahead to the games in Turkey. "